Travel deep down from Bangkok along the long and narrow peninsula of Southern Thailand which offers a great diversity of nature and culture. Enjoy spectacular sceneries of thick jungles, rugged mountains, limestone pinnacles, emerald blue sea and fishermen villages. Discover the beauty of national parks, graceful temples, coral reefs and colorful marine life and some of the most spectacular beaches of Southeast Asia along the coastlines of the Gulf of Siam and the Andaman Sea. The trip ends in Phuket. 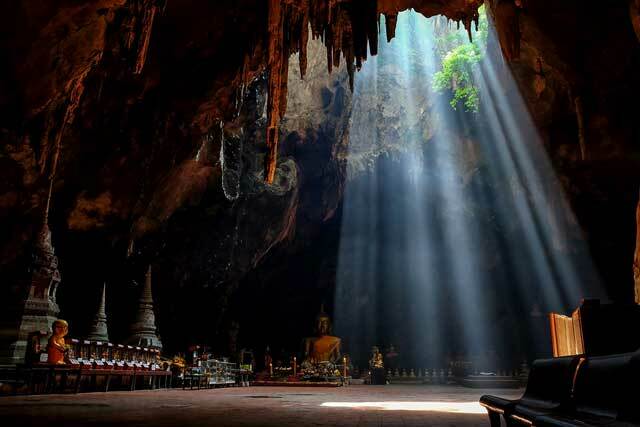 This cave is one of the most photogenic cave in Thailand due to the light rays searing through the cave tunnel. Those who love beaches and sea will fall in love with Krabi province as it offers a wide range of destinations and activities from Beaches, Waterfalls to Mountains. 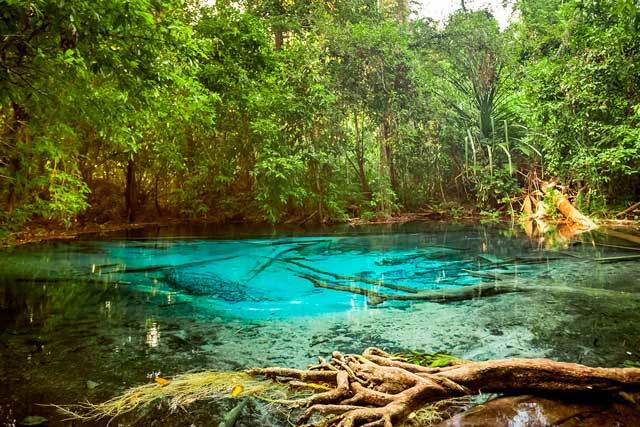 Explore the mangrove forest and Thai’s coastline. Bewildered by the magnificent mountains and species of waterbirds as you journey with the long-tail boat along the canal. 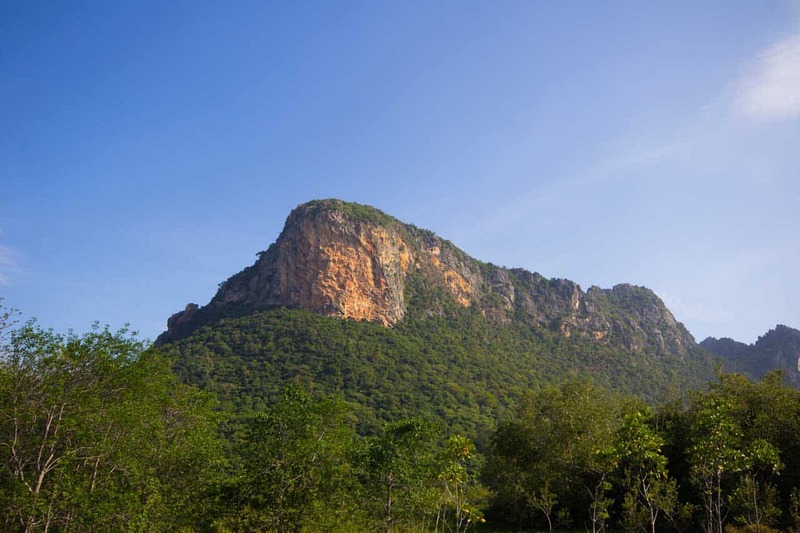 After breakfast, drive 20 kilometers to Hua Hin, Prachuab Khirikhan Province literally means stone head in Thai. It is Thailand’s oldest beach resort and popular among Thais and foreign visitors for clean white sandy beaches with crystal clear water, tranquil atmosphere, golf, spa and seafood. Depart for Khao Sam Roi Yod National Park. Located 63 kilometers south of Hua Hin, this coastal national park covers an area of 98 square kilometers with lime-stone mountains, mangrove swamps, and beaches. It is also home to various kinds of local and migrating birds, which are plentiful from November to February. Take a boat trip to Laem Sala Beach and walk up a beachside mountain to see the famous Tham Phraya Nakhon cave. The main attraction in the cave is a Thai style pavilion constructed in 1890 during the reign of King Rama V. Continue to Chumphon, a gateway province to the South of Thailand with 200 kilometers long beautiful and quiet seashore. Overnight at hotel in Chumporn. Breakfast at hotel. Drive to Surat Thani, The largest province of the South located 685 kilometers from Bangkok. Besides numerous beautiful islands along the coast such as Koh Samui, Koh Pha Ngan and Koh Tao which make Surat Thani a perfect hideaway for vacationers from around the world, the province is also important for its long history as an ancient community of indigenous people. In the 13th century, the city was a center of the glorious Srivijaya Empire, the kingdom that dominated the whole Malay Peninsula and much of Java. Drive to Suan Mok Meditation Center, founded in 1959 by Buddhadasa Bhikkhu, one of Thailand’s most famous monks. It is set in a serene ambience conducive for meditation or contemplation of the philosophy of life. Buddhadasa Bhikkhu’s philosophy is universal in nature, a combination of Zen / Taoist and Christian elements with the Theravada Buddhism. Then continue to Chai Ya district to visit a restored ancient temple, Phra Borom That Chaiya, built around 1200 years ago. The ancient stupa in Srivijaya style housing the Lord Buddha’s relics is highly revered by local residents. Further to Krabi, one of the most attractive beach destinations in Southern Thailand. The province is an ideal getaway destination teeming with natural attractions including white sandy beaches, fascinating coral reefs, numerous large and small islands and verdant forests with caves and waterfalls. Overnight at the hotel in Krabi. Breakfast. Enjoy a full day tour in and around Krabi including the visit of the 40 Million years old shell cemetery. In the afternoon, take a boat trip to visit some islands and beaches around Krabi such as Poda Island group and Phranang Bay with rich marine resources, fine-grained white sand and crystalline water. Guests enjoy snorkeling, swimming and sunbathing before returning back to the hotel. Overnight at the hotel in Krabi. Breakfast. Morning, visit Than Bok Khorani National Park with great diversity of species of trees and an attractive emerald pond. Then, go on by bus to Phang Nga Province, about 790 kilometers South of Bangkok. Visit the famous Phang-nga Bay National Park, a geological wonder with striking scenic views, filled with islets, sunken caverns, startling rock formations and mangroves. Take a boat ride to some islands of the park including Ko Panyi with limestone hills and an interesting Muslim fishermen community, and Khao Phing Kan, named after its nature of being split into two halves. Drive to Phuket. Transfer to the airport or to the hotel.